Draft: 2013, New York Mets, 10th rd. Luis Miguel Guillorme graduated from Coral Springs Charter High School (FL) where he played four years of baseball...During 2017 spring training, he caught a bat in mid-air in the dugout after it slipped out of Adeiny Hechavarria's hand...The video went viral and ended up as a SportsCenter Top Play...Played for Spain during the 2016 World Baseball Qualifier at Rod Carew Stadium in Panama City, Panama...Went 1-7 with one RBI and two walks in two games...Participated in a youth baseball Futures clinic at Hinton Park with fellow Sterling Award winners in September, 2015. Played in 35 games (14 starts) across two stints with the Mets...Made 10 starts at third base and four starts at second base...Was recalled from Las Vegas (AAA) on May 9 and was with the major league club from May 9-June 26 and July 28-August 13...Made his major league debut as a pinch-runner and scored a run in the Mets' 3-1 win over Philadelphia on May 11...Was the second Met in team history to score a run in his major league debut without an at-bat...The other was Steve Bieser on April 1, 1997 at San Diego...Collected his first major league hit with a pinchhit single on May 13 at Philadelphia...Drove in his first run on May 15 vs. Toronto...Made his first MLB start on May 16 vs. Toronto... Went 1-3 and became the first Mets player since Steven Matz (June 28, 2015) to start his career 3-3...Played in 69 games for Las Vegas (AAA) of the Pacific Coast League...Batted .304 (75-247) with 15 doubles, two triples, three homers, 33 RBI, 41 runs scored and a .380 OBP. Was named an Eastern League Mid-Season and Post-Season All-Star...Won the Mets Sterling Award, symbolic of the Most Valuable Player at Binghamton (AA)...Finished fourth in the EL in hits (136), second in walks (72) and led the Rumble Ponies with a .376 OBP...Was the toughest player in the Eastern League to strikeout, once every 10.15 plate appearances...Hit over .300 in three separate months...Hit .342 (26-76) in 20 April games, .320 (32-100) in 26 contests in June and .301 (31-103) in 30 games in August...Compiled a .291 (104-357) batting average vs. righthanded pitching...Hit .311 (41-132) with men in scoring position...Divided his time on the field between second base and shortstop…Also saw limited action at third base...Went 5-5 at Portland on April 12...Hit his lone home run at Harrisburg on August 5...Named to the Arizona Fall League Rising Stars team after he hit .289 (13-45) with three doubles and three RBI in 11 games for Scottsdale. Appeared in 72 games at shortstop and 52 games at second base while playing the entire season with St. Lucie (A) of the Florida State League...Hit .291 (25-86) during the month of June...Played for Spain during the 2016 World Baseball Qualifier at Rod Carew Stadium in Panama City, Panama...Went 1-7 with one RBI and two walks in two games. Named the South Atlantic League's Most Valuable Player and a South Atlantic League post-season All-Star...Was Mets Sterling Award winner at Savannah, emblematic of the top player on his Savannah team...Finished the season among the league leaders in the SAL...Was second in batting average (.318) and hits (142)...Had the fourth-best on-base percentage (.391). April 22, 2019 New York Mets recalled SS Luis Guillorme from Syracuse Mets. 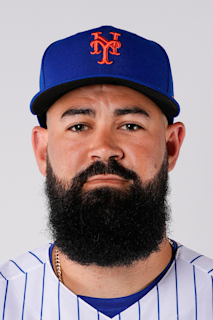 April 15, 2019 New York Mets optioned SS Luis Guillorme to Syracuse Mets. October 2, 2018 New York Mets recalled Luis Guillorme from Syracuse Chiefs. August 13, 2018 New York Mets optioned Luis Guillorme to Las Vegas 51s. July 28, 2018 New York Mets recalled Luis Guillorme from Las Vegas 51s. June 26, 2018 New York Mets optioned SS Luis Guillorme to Las Vegas 51s. May 9, 2018 New York Mets recalled Luis Guillorme from Las Vegas 51s. March 20, 2018 New York Mets optioned SS Luis Guillorme to Las Vegas 51s. November 20, 2017 New York Mets selected the contract of Luis Guillorme from Binghamton Rumble Ponies. April 5, 2017 2B Luis Guillorme assigned to Binghamton Rumble Ponies from St. Lucie Mets. March 30, 2017 SS Luis Guillorme assigned to Las Vegas 51s. January 11, 2017 New York Mets invited non-roster SS Luis Guillorme to spring training. March 6, 2016 SS Luis Guillorme assigned to New York Mets. April 3, 2015 Luis Guillorme assigned to Savannah Sand Gnats from Kingsport Mets. September 3, 2014 SS Luis Guillorme assigned to Kingsport Mets from Savannah Sand Gnats. August 30, 2014 SS Luis Guillorme assigned to Savannah Sand Gnats from Kingsport Mets. June 18, 2014 SS Luis Guillorme assigned to Kingsport Mets from GCL Mets. June 28, 2013 SS Luis Guillorme assigned to GCL Mets. June 14, 2013 New York Mets signed SS Luis Guillorme.